Supports up to 520 sheets in each tray: A total of 1560 sheets of A3, A4, A5, Executive, Folio, JIS-B4, JIS-B5, Ledger, tabloid (11x17 in. ), Legal, Letter, Statement and Oficio sizes. Paper, card stock, labels and transparencies may be used from the three trays. All three trays support up to SRA3 (32 x 45 cm) or super tabloid (12x18 in.) size paper. Tray-present, paper size, paper-present, paper-low sensing and transparency sensing are supported. 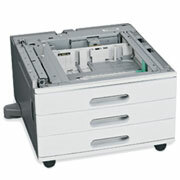 Installs below the MFP or printer and raises it to the correct height for use with the Finisher. A total of 1560 sheets of A3, A4, A5, Executive, Folio, JIS-B4, JIS-B5, Ledger, tabloid (11x17 in. ), Legal, Letter, Statement and Oficio sizes. Paper, card stock, labels and transparencies may be used from the three trays. All three trays support up to SRA3 (32 x 45 cm) or super tabloid (12x18 in.) size paper.